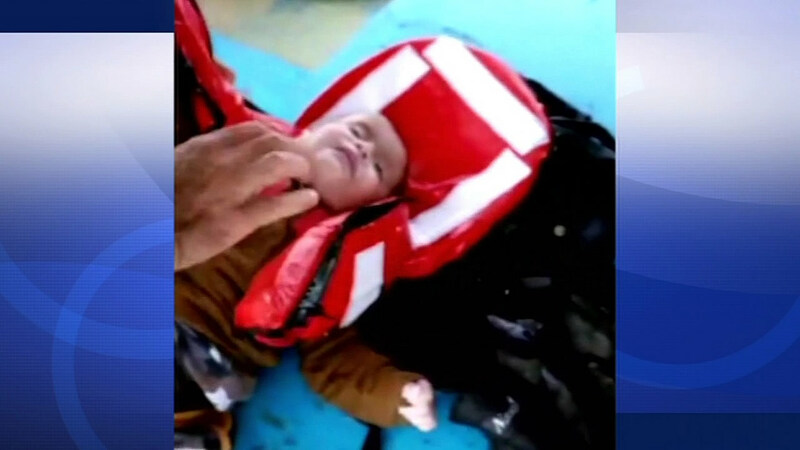 Two fishermen helped rescue an 18-month-old Syrian migrant baby after they found him floating on the Aegean Sea, according to a private Turkish news agency. DHA officials said Muhammed Hasan was rescued on Wednesday when the fishermen spotted him floating in a life jacket after the boat that was carrying him, his mother and around a dozen others to a nearby Greek island sank. Dramatic video shows one of the fisherman pulling the young boy out of the water and quickly turning him upside down to get the water out of his lungs. Officials said he covered the boy in blankets and called for help. The fishermen named Recep Evran and Cenap Gumran visited Muhammed and his mother, Lorin Halef, in the western province of Izmir to check in on the family Saturday.